(Nanowerk News) Complex magnetic structures are at the heart of promising new materials for devices in "spintronics", a field of research aiming at more energy efficient data storage and processing. A prominent example is the so-called spin valve, where the magnitude of the electrical current passing through a device is very sensitively dependent on its magnetic configuration. These configurations can be readily controlled by a magnetic field in artificial layer systems, resulting in the giant magnetoresistance effect (GMR), a discovery rewarded with the 2007 Noble price in physics to Albert Fert and Peter Grünberg. The material exhibits distinct magnetization plateau connected with different spin configurations. While classical GMR systems are composed of metallic layers, complex oxides often intrinsically provide layered structures with alternating magnetic configurations that can act as spin valves. 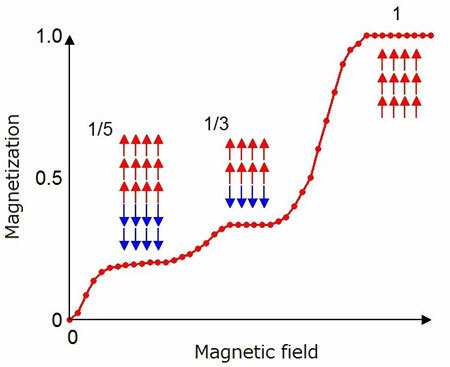 Cobalt oxides are a class of materials that can exhibit complex magnetic order that changes with increasing magnetic field, as for example indicated by distinct plateaux in the magnetization curve. A Japanese team of researchers led by the group of Associate Professor Hiroki Wada at the University of Tokyo has been successful in characterizing the magnetic structures of the complex cobalt oxide SrCo6O11 using the high-field diffractometer of BESSY II. Synthesis of new materials often results in tiny samples, and the crystals studied here had a diameter of only 0.2 mm. With the very high sensitivity of resonant diffraction, a core competence at the UE46_PGM1 beamline of BESSY II, they managed to observe a fascinating type of spin order in the samples that are hardly visible by the bare eye. This order is called devil's staircase, characterizing a phenomenon, where a pletora, in principle even an infinite number, of so-called commensurate superstructures - magnetic configurations in the present case - can be realized by tuning an external parameter, e.g., a magnetic field. 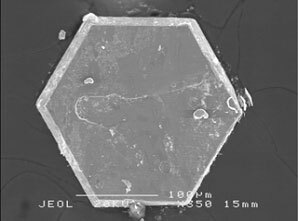 Hexagonal single crystal of SrCo6O11, with a sample diameter of approximately 0.2 millimetres. This exceeds the characteristic of a spin valve and may open new paths in spintronics. The research was carried out in close cooperation with German scientists from the Institut für Festkörper-und Werkstoffforschung Dresden and HZB. The results are now published in Physical Review Letters ("Observation of a Devil's Staircase in the Novel Spin-Valve System SrCo6O11").